This is an amazing 1930's vintage black dress that in a Victorian style. 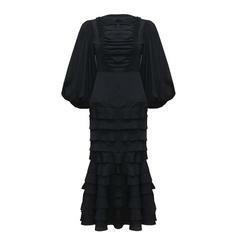 This lovely dress has a ruffled neckline and ruffled cuffs on the long sleeves. It is a silk satin fabric, and there are unique seams on the bodice that creating a fitted empire waist style. 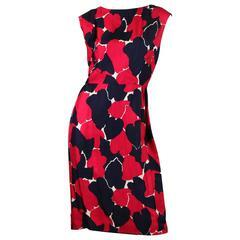 There is a metal zipper closure in the back and we estimate the dress to fit a modern day size 2/4. Please review all of the measurements for the best fit. We acquired this dress when we recently purchased an estate of 1910-1930's vintage clothing from a single owner. This is something that would fit in perfectly with today's modern wardrobe, re-confirming our belief that good clothing can truly be timeless! 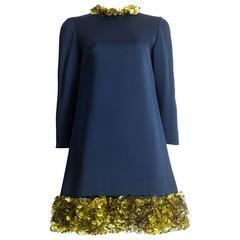 BUST: 34" WAIST: 28" HIPS: 36" LENGTH: 58" SHOULDERS: 14" SLEEVE: 24"
Blue silk evening mini dress adorned with gold circular mirrored disks and beads, zip fastening at the back and silk lining. Unknown designer, couture number inside. 1940s Black Chantilly Lace Ruffled Gown with Corset Bodice and Crinoline formerly owned by Vivienne Della Chiesa.